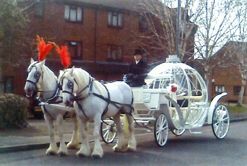 Victorian Carriages Limited has supplied horse drawn carriages for weddings and special occasions for the past 25 years. The company has 9 carriages, which have been restored to their original Victorian glory and offer an unforgettable transport experience for special occasions. One of the carriages was regularly used by Sir Arthur Conan Doyle. 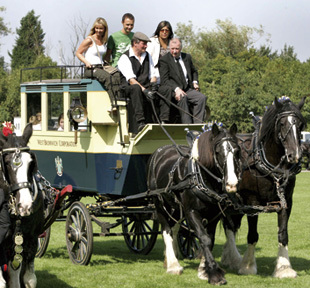 Victorian Carriages are based in the 4000 acre Sandwell Valley and use15 working horses acres to pull the carriages. All the horses are native breeds of the British Isles – including Cobs and two shire horses; there are black, white and mixed colour horses which can be used to complement the occasion. Victorian Carriages are regular participants at Harness Horse shows including the Sandwell Valley Harness Horse Show, an annual event every September. Named after Lord Brougham, who recently used it for his son's wedding in London. works with Bangra bands and Dhol drums. 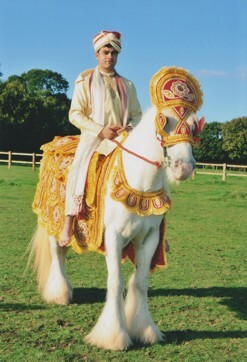 Comes with two grooms, genuine saddle and bridle. 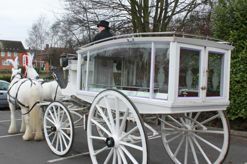 Victorian Carriages have Professional Indemnity Insurance through NFU which meets Local Authority Health and Safety requirements for outdoor and on street events.